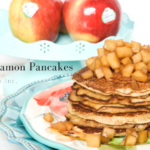 What You Need to Know About Nutrition and PCOS | Ignite Nutrition Inc.
We work with many women with Polycystic Ovary Syndrome and all too often we hear the same story about their diagnosis. They are told they have PCOS and then left with the advice to just ‘lose weight and eat healthy’. But most women with PCOS have already tried to lose weight…multiple times. And the generic advice of “eat healthy” doesn’t really give you anything to work with. You leave the doctors office with more questions than answers and your google search leaves your head spinning with conflicting information. If this sounds familiar…read on. 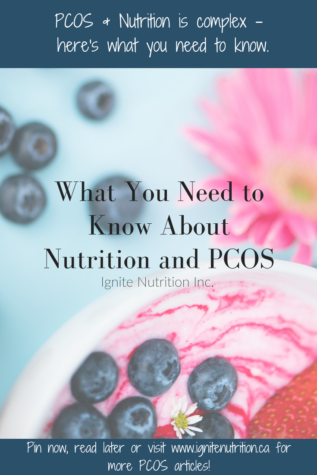 I’m Jen Rawson, Women’s Health dietitian at Ignite Nutrition, and we are going to cover the basics of what PCOS is, how you can manage your symptoms and why weight loss isn’t our recommended advice. Polycystic Ovary Syndrome (PCOS) is a hormonal disorder where the ovaries produce excess androgens (male hormones) leading to weight gain, irregular menstruation, infertility, and hair growth. Although the name implies cystic ovaries, not all women with this disorder have follicles on their ovaries and some women have polycystic ovaries without having polycystic ovary syndrome. What is the role of insulin resistance in PCOS? Insulin is a hormone that is released in response to glucose in the blood. Insulin acts as a key to our bodies cells that opens the door to allow glucose into the cell to be used for energy. Insulin resistance occurs when this key is not opening the cell doors. In response, the body releases more insulin to get those ‘doors’ open resulting in hyperinsulinemia. Hyperinsulinemia is responsible for the excess androgen production, inflammation, and multiple symptoms experienced by women with PCOS. Therefore, much treatment for PCOS is aimed at improving insulin resistance and reducing overall insulin levels in the body. The cause of PCOS is unknown but there is a clearly defined genetic component. Currently, 6-10% of women are affected by PCOS, meaning you are not alone. It is important to note that patients must be off Oral Contraceptive for at least 6 weeks prior to measuring hormone levels for accurate results. Additionally, many symptoms of other conditions can overlap with PCOS and these must be ruled out before a diagnosis of PCOS is made. The goal for treatment of PCOS is the management of symptoms, prevention of health risks and improving fertility. Primary treatment is aimed at diet and lifestyle modification. Medication and supplements may provide adjunct therapy. What most women google, or are told by their doctors is that a low-carbohydrate diet and weight loss are the first recommended treatment options for PCOS. Studies have shown that a 5-10% reduction in weight improves insulin resistance, associated hyperinsulinemia as well as ovulation, menstrual function and pregnancy rates. But what no one ever talks about is how difficult it is for women with PCOS to lose weight. We see that just a low carb diet to achieve a 5-10% reduction in weight loss and maintaining that benefit is almost impossible because of their insulin resistance and how challenging a low carbohydrate diet can be with intense carbohydrate cravings. And of course, studies only look at a snapshot in time and hard outcomes. The longest studies are about 6 months and don’t go beyond to see – how many patients regain the weight? How many regain more? And are they actually WORSE off, because of the long term impacts of a short term restrictive diet? I’m going to get real with you on dieting. You’re probably not going to like it. But here’s the evidence based outcomes of weight loss, long term. From long-term weight loss studies, we know that the majority of people regain the weight they lost within 5 years. Not only that, but the majority of those that have lost weight not only regain to their baseline, but also gain ABOVE their baseline. Did you know – the number of diets you’ve done is actually a predictor of weight GAIN over time, not weight loss? Many people think, weight cycling (repeated weight loss and regain) is better than no weight loss at all. However, weight cycling is not benign, and in fact can be harmful. Weight cycling is associated with an increased risk of heart attack, dyslipidemia, and diabetes. Women with PCOS are already at a higher risk for all of these health outcomes so weight cycling may further increase their risk. At Ignite Nutrition, we recognize that low-carbohydrate diet plans and focusing on weight loss goals do not lead to sustained change and can actually increase cardiovascular risk factors and lead to body dissatisfaction and eating disorders. Therefore, we take a holistic health approach that considers both physical and mental health. We work with our clients to achieve positive behaviour changes goals in the areas of diet, sleep, stress, and exercise that lead to management of PCOS symptoms and long-term disease risk factors without a focus on weight. At Ignite Nutrition, we see the best outcomes when we take an individual approach to dietary management and work with each of our client’s current dietary patterns to make small and sustainable changes that actually work for their lifestyle. These are just a few simple ideas that have a BIG impact on health, wellbeing, PCOS symptoms, fertility and more – of course, we will tailor them to you – so they may vary depending on your goals, medical history, and lifestyle. As Dietitians, we take a holistic approach to health and will also work with clients to understand and make changes to their lifestyle. Sleep, stress, and exercise are all very important components that can impact PCOS – and something we take a close look at. We like to say that we act as coordinators of care – we often provide suggestions within lifestyle categories, but have an amazing group of professionals we refer to as needed. Medications can be very effective in relieving symptoms of PCOS for women. However, there are always side effects and risks to consider. We find patients do best when they are used in combination with lifestyle and nutrition changes. OCPs are the most common medication used in PCOS. They can restore regular periods and reduce acne, hirsutism and alopecia. However, OCPs do have some associated risk factors such as increased risk of blood clots, elevated triglycerides and increased inflammation. Spironolactone is an androgen blocker which helps women in treating hirsutism and alopecia. It’s important to note this medication cannot be taken in women who are or may become pregnant as it is can cause birth defects. Metformin works as an insulin sensitizer. By improving the body’s response to insulin, carbohydrate cravings can be reduced, weight loss may occur and testosterone levels are decreased which can induce ovulation and reduce first trimester miscarriages. Metformin commonly causes gastrointestinal side effects including nausea and diarrhea, therefore working with your doctor to slowly titrate up the dose is highly recommended. Omega-3 fats (particularly long-chain EPA &DHA) have been shown to improve insulin resistance, hirsutism, inflammation, and fertility in women with PCOS. Omega-3 supplements are generally accessible and well tolerated, particularly if choosing an enteric coated variety which can prevent symptoms such as fishy burps or nausea. Additionally, Omega-3 fats can be found naturally in foods such as fatty fish, walnuts, flaxseed and canola oil. Inositols (Myo-Inositol and D-chiro-inositol) act as secondary messengers for insulin. A 2016 review stated that “combination inositol therapy (Myo-Inositol and D-chiro-inositol) has the potential to improve all symptoms, signs and laboratory anomalies of PCOS. Therefore supplementation with inositols may be considered a first-line therapy option. Deficiency in vitamin D is prevalent among women with PCOS. Corrected deficiencies can improve fertility. Additionally, Vitamin D plays a role in insulin pathways and vitamin D is positively correlated with insulin sensitivity, however, more studies are needed to understand the role vitamin D plays in insulin resistance. What appears clear right now is that prevention and correction of a vitamin D deficiency can positively influence PCOS outcomes. Additional supplementation when levels are already adequate is not warranted. 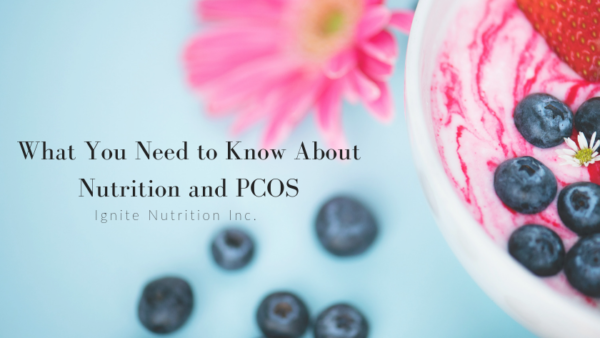 PCOS is a complicated metabolic disorder, and often times, dietitians can help guide you in making safe and impactful health and wellness changes to help manage your condition. However, often times, we see our patients having previously made drastic changes – many of which alter your relationship with food, and your body, impact long term disease risk, and frankly, end in frustration. So many of our patients say ‘I wish I had done this sooner’, ‘I wish I had been suggested to see a dietitian upon diagnosis’. It’s not too late to work with one of our dietitians today to meet your health goals. At Ignite, we will listen to your personal PCOS story and work with you to come up with an individualized diet and lifestyle plan that fits your life. Ready to work with one of our dietitians today? Book an appointment with me, or one of our other dietitians here. Ulen C.G., Huizinga M.M., Beech B. & Elasy T.A. (2008). Weight Regain Prevention. Clinical Diabetes, 26(3), 100-113. Mann T., Tomiyama J., Westling E., Lew A., Samuels B. & Chatman J. (2007). Medicare’s Search for Effective Obesity Treatments. American Psychologist, 62(3), 220-233. Kalra B., Kalra S. & Sharma J.B. (2016). The inositols and polycystic ovary syndrome. Indian J Endocrinol Metab, 20(5), 720-724. Al-Shoumer K.A. & Essa T.M. (2015). Is there a relationship between Vitamin D with insulin resistance and diabetes mellitus? World J Diabetes,6(8), 1057-1064.